Experience the Alaska you’ve dreamed of on this fully-escorted, 7-day, 6-Night Alaska tour. 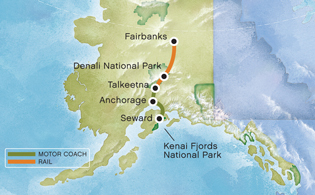 Your Alaska trip package includes the Kenai Fjords National Park cruise, a sled dog kennel tour with an Iditarod champion, the Tundra Wilderness Tour of Denali National Park and a gold rush tour and riverboat excursion in Fairbanks. Enjoy breakfast with the group and then make the trip via motor coach to the port town of Seward. Embark on the 11:30 AM departure of the Kenai Fjords National Park Cruise. Experience narration from an onboard naturalist, an included lunch and breathtaking sights, not to mention an abundance of Alaska sealife! This morning we'll transfer you to the airport and leave you with fond Alaska memories.